It looks like it wants to go places – fast. The body shaped like a vintage race car, the debris bag like a sail on a sail sand buggy, big front wheels suggesting powerful drive. Does all of this translate into powerful cleaning in the pool? Pentair only entered the pressure side cleaner market fairly recently compared to its well-known competitor Polaris. We reviewed their racy looking cleaner to help you decide whether this could answer your pool cleaning needs and if it’s worth the money. What do you need to be able to use this? Will it work with your existing booster pump? The Pentair Racer needs its own dedicated line and to be connected to a booster pump which means it will not run on the main pool pump. You do need a booster pump. The kit includes a pressure sensor to connect to the wall outlet allowing you to adjust the outward pressure. The higher the pressure the faster the cleaning. This is also useful if you want the cleaner to climb or not climb the sides. The adapter of the flow valve is Pentair Racer specific but a Polaris one should work as well. Choose your most pressing question below or scroll down for the full review. What’s in the box? Are hose and bag attachments included? How fast does it clean the pool? How well does it clear the pool? Are the brushes safe to use on vinyl liners? Can it be used in a salt water pool? Are there any parts I will have to replace regularly? What are the LED lights and sweeping tail for? If you have a chlorinator, solar system, ozone generator or air inducing equipment installed you are advised to contact Pentair customer service. Basically, these are air inducing devices which can cause the unit to pick up air and float. Yes. Everything is very user-friendly and the instructions are very clear and helpful. Before lowering the vacuum into the pool you will need to do the initial installation, which should take you 20 to 30 min, including reading the manual. You will need to cut the feed hose according to the instructions to fit your pool size -easy. Install the wall fitting adapter, valve and flow gauge – easy. Connect the feed hose to the cleaner – easy one-click. Speed is one of the strengths of this cleaner. It claims to be 30% faster than any other side pressure cleaner on the market. As a rule of thumb Pentair recommends a one-hour cleaning cycle for a pool of about 15’ x 30’ . And there are many pool owners happy with the result after one to two hours. This means you can spend your time doing something else, gaining 2 to 3 hours per week and enjoy your pool more. Not only that, but this little machine could potentially do the cleaning faster than you. Pool owners who had experience with Polaris products will often point out that it cleans faster than similar pressure cleaner models. Within that time, the Racer should cover most of the pool floor. By alternating the pressure jets on the sides, front and rear the unit is being steered along, following its own unique cleaning path cycle, turning left and right as well as reverse every couple of minutes for maximum coverage no matter what shape of the pool has. It keeps vacuuming regardless of the direction it goes, forward or backward, which is how it gets the work done faster than other models. This should also help it to get unstuck should it manoeuvre itself into a tight corner, but unfortunately it doesn’t quite work like that all of the time and might need the odd push and encouragement to move on. Sometimes, when it gets stuck it will climb up a wall a bit and flip around thanks to its four wheels. It is not really designed to climb stairs and won’t clean the sides or waterline. How well it climbs depends on the steepness of slopes and water flow. This cleaner features a wider than usual feed hose, a larger opening on top between debris bag and cleaner body (you can almost get your hand in there) and a large inlet opening for vacuuming leaves, seed pods, twigs and moving them into the impressively big debris bag without difficulty. The bag stays upright throughout thanks to its own floatation device. This and the 4 venturi jets ensure that all debris can make it to the top to be trapped and removed later. The rotating front brush does a good job in picking up sand and dirt provided the cleaner is adjusted to optimum speed. The unit is easy to remove from the pool and the bag with its wide opening easy to empty and then clean with a hose. Yes. The bristles do a good job in brushing up debris but not too stiff and harsh to damage your pool. Overall the cleaner has no sharp edges or parts. The wide wheels are made of soft rubber as well. As long as your vinyl is in good shape and doesn’t have any pebbles under the surface or cracks etc there is no need to worry. Unfortunately, this cleaner seems to have more than its fair share of breakages. Even though it looks tough, powerful and made for speed, there is a tendency for wheels to come off and attachment points to break. However, it is possible to obtain fairly priced spare parts. Hopefully, Pentair will address these issues soon. There are two blue LED lights on the side of the unit, a somewhat unusual feature on a pool cleaner. It’s indeed interesting to sit and watch the lights moving about in the dark. It could also be useful if you do most of the cleaning at night and like to have a quick peek every now and then to check its progress. We found them to be more of a gimmick than anything else. It certainly doesn’t add to the main function which is cleaning. We were also not overly convinced by the sweeping tail that can be plugged into the rear end of the cleaner. It tends to shift the balance of the vehicle making it a little unstable to the point that it can flip over. The instructions even state that it is not necessary for most pools anyway leaving us wondering how it could possibly enhance the cleaning. The unit certainly runs more stable without it. 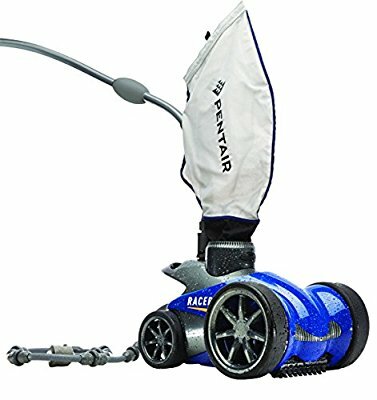 The Pentair Racer is a noteworthy side pressure cleaner ready to gain its share of a market dominated by Polaris. It does so by introducing better looks and a speedier cleaning cycle. However, it would benefit from more reliability and more durable plastic parts rather than flashy LED lights. Thankfully, all parts are available for purchase, if needed, making it a recommended buy for pool owners. The Pentair models are first and foremost less expensive than the competitor. The Racer retails for well under $600. However, be prepared to add replacement parts fairly frequently. When shopping around online do make sure you check return policies before making your purchase. We also strongly recommend ensuring you are buying from a genuine Pentair dealer. Amazon has proven to have convenient and reliable return and warranty policies. They also gather genuine customer feedback making them a perfect place to either do more research or check on price and availability. This entry was posted in Reviews on June 25, 2016 by Pool Urchin.